CHASING FOOD DREAMS: Steamboat Castle, Kota Kemuning: A Steamy Affair with The Glutton Gang! Steamboat Castle, Kota Kemuning: A Steamy Affair with The Glutton Gang! Home Style Steamboat with Live Seafood! Another family outing or should I say family dinner with my glutton gang landed in Kota Kemuning recently. As my family (or as I cheekily named them as The Glutton Gang) has been raving about this awesome home style steamboat place to me for ages, it was only recently I got to visit. Since one of my sisters was visiting, we all congregated at Steamboat Castle in Kota Kemuning for a steamy affair of steamboat. 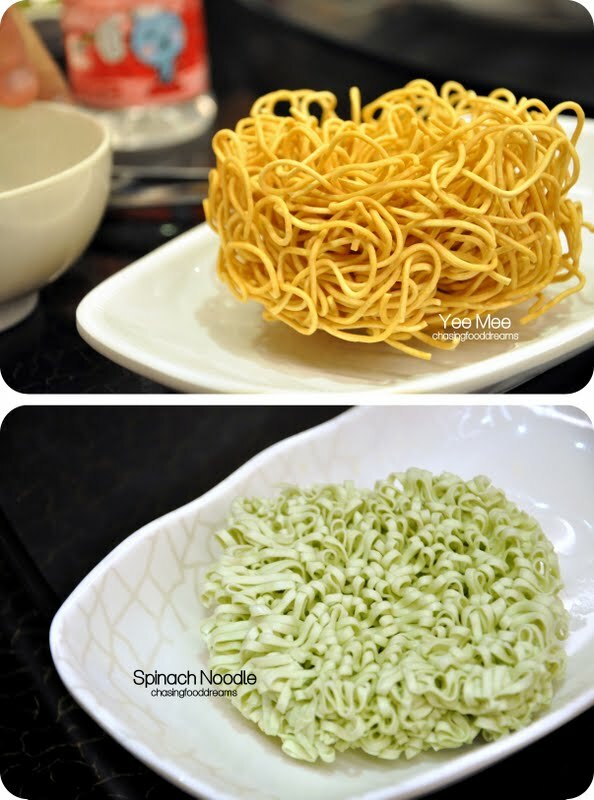 There are just so many steamboat restaurants nowadays that people are just spoilt for choice. What make each one different are the price range and the quality of the ingredients. I always believe you get what you pay most of the time. If you are paying less than RM20 for each pax, then you should know that the main ingredients will consist of mostly all sorts of processed food. 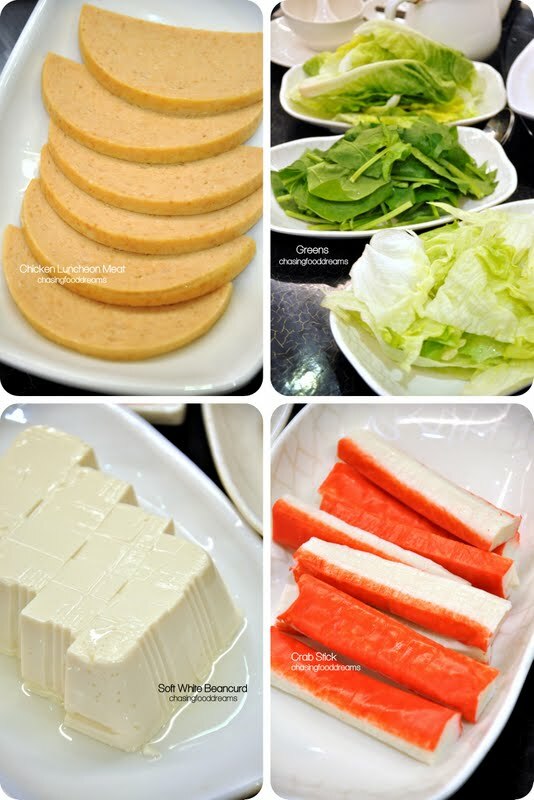 In this case, Steamboat Castle is priced higher and everything is ala carte because their steamboat ingredients showcase fresh ingredients and very minimal processed food. They also focused more on home style because of their broths and their ingredients. The castle is nicely decorated with plenty of air conditioning units to keep their customers cool while swishing their steamboat enjoyment. The whole place is mostly color toned in neutral except for a panel of red to bring up some colors. As I arrived, my family had already put in orders and everything was nicely laid out waiting for the rest of the gang to arrive. What I saw pleased me right away… the choices of sauces! Unless the restaurant has a super awesome signature sauce, choices of various ones are always a good thing. We were given Garlic Oil, Red Chili Sauce, Green Chili Sauce, Chili Oil, Mustard Sauce and Dried Shrimp Chili. Go ahead and make the sauce your own! I am very particular about broth or soup for steamboat. At Steamboat Castle, there are a few choices for soup like their signature Pork Bone with Corn Soup, Drunken Chicken Soup, Fish Tale with Pickle Cabbage Broth, Teochew Broth, Century Egg with Parsley, Tom Yam and Pig Stomach with White Pepper. Soups are charged separately and one can enjoy a duo of soups. We had the Pork Bone with Cord and Herbal since we wanted to enjoy some simple and comfort soups. 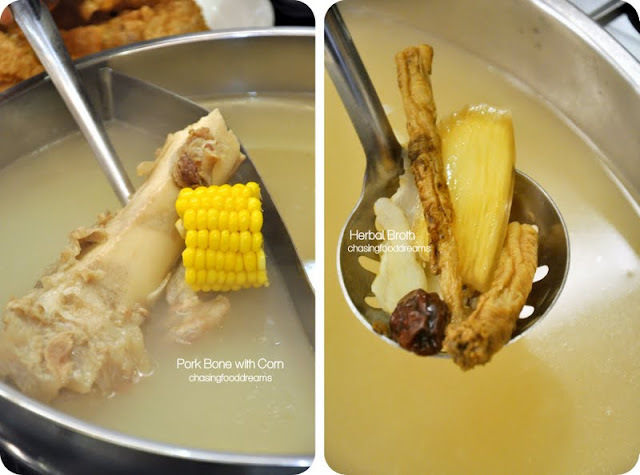 Pork Bone with Corn is really sweet and delicious. The huge bone is rendered to pure porky essence and the natural corn sweetness makes the broth warming and delightful. The other Herbal one was decent but I definitely prefer the first soup. Golden Pomfret was also really sweet in flavor. It’s a cheaper version of its highly prized cousin, the pomfret. The Fish balls, Prawn balls and Meatballs are homemade. These render a better flavor than those pre-bought ones so another plus point for Steamboat Castle. I am a big pig offal fan so when I saw that they have Pork Liver and Pork Kidney on their menu, I was excited! My family is also a huge fan and we have several orders of these. It’s not often we can find these so we really enjoyed them as they were nice and fresh. Other goodies included Fish Maw, Luncheon Meat, Dumplings, Fried Bean Curd, Greens, Bean Curd, Crab Stick and Noodles. In addition to the steamboat, we also ordered Golden Fried Oyster Mushroom and Spicy Fried Chicken to munch on. The spicy fried chicken was so good and spicy that we had to order another plate. Watch out for those little stingers of Szechuan peppers! Big thanks to my Sista for the treat! Big fan of steamboat, best to have it to fight the rainy season! Especially great when the selections are fresh, and Pork bone soup for the dipping is excellent choice ! Looks like need to venture to Kemuning soon from USJ ! I love steamboat! The ingredients here look really fresh and I'm a huge fan of Pork liver too, that plate just looks soooo irresistible. LIKE!!!! Haven't had steamboat for a while now...must get down to it soon! yep.. you can also DIY yours... else come over here! Oh yes! Looking real good there..I'm in kota kemuning and I don't even know there is such awesome steamboat restaurant. I must go try. I love steamboat. Have Yourselves A Merry Little Christmas!